As you know, during the End of the Year Specials all players in World of Tanks will be able to purchase or complete a mission for the Tier VIII Chinese premium heavy tank, the WZ-111. This vehicle first appeared on the Chinese server and many of you have been wondering what this war machine is all about. Well, it's time to rip off the veil of secrecy and examine this mysterious visitor from the East. As mentioned, the WZ-111 is a Tier VIII Chinese heavy tank. If you want to define it in one sentence, it is the younger brother of the Chinese Tier IX standard heavy tank, the WZ-111 model 1-4. Their kinship is manifested primarily in the design and, as a result, the armour. This is definitely an advantage, because the frontal plates of the Tier IX one are very good, effective even in Tier X battles. The WZ-111 is a Tier VIII tank with Tier IX armour, which does not meet Tier Xs in battle thanks to its preferential matchmaking. Of course, the WZ-111 is not the Maus, so you shouldn’t rely solely on your armour. In terms of protection, the tank is rather similar to its Chinese peer, the 112.The general formula is as follows: a strong frontal plate that cannot be easily penetrated and a similarly strong turret but one that has relatively big, weak hatches on the top. Angling the tank is generally discouraged, because the frontal plate has a “beak” shape, similar to the IS-3 for example. If you angle it wrong, you may nullify the extra armour effectiveness stemming from the “beak’s” angles. When it comes to armament, the WZ-111 is equipped with the standard 122mm gun D-25T, which is also used by the 112 and T-34-3. The great alpha damage is compensated by low accuracy and slow rate of fire. The average penetration value of the AP shells suits engaging in combat at close range where it is possible to aim for enemy weakspots. However, HEAT shells have significant penetration potential, which can threaten even the toughest Tier IX tanks. The tank’s mobility is above average. If driving in a straight line, the vehicle can reach 40-45km/h rather easily, so returning to defend the base or changing flanks will not be a problem. 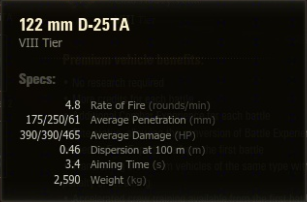 The view range is also quite decent (380 meters) and the ammo rack holds a total of 45 shots, which should be enough. 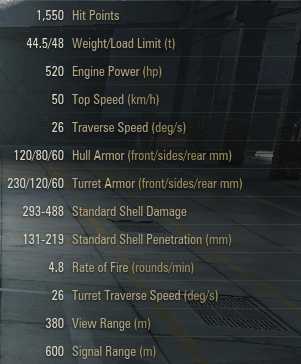 The tank’s crew layout corresponds to other heavy tanks in the Chinese tech tree. The crew consists of 4 tankers, the Commander assuming the role of the Radio Operator at the same time. Due to the vehicle’s premium status, the crew will earn more experience than on a standard vehicle and you can assign any Chinese heavy tank crews to the WZ-111 without having to retrain them first. We recommend the following skills and perks for your crew: Sixth Sense, Repair, Brothers in Arms, Snap Shot and Off-Road Driving. As for equipment, the standard configuration should be effective: Improved Ventilation, Vertical Stabilizer and Gun Rammer. Replacing Ventilation with Coated Optics can also work, especially on open maps. Remember these are only suggestions. Feel free to experiment to find the combinations that best suit your play style. The WZ-111 is designed for close combat. The tank is equally useful on both the offensive and defensive. In Tier VIII battles it can lead the attack, shielding less-armoured allies. Of course, don’t rely solely on your armour – try to move from cover to cover and hide the vulnerable lower glacis. While on the defensive, prioritise positions that will prevent you from being surrounded. Ideally, a rubble heap or a destroyed tank in a narrow street is what you should be behind. Try to play with your turret as much as possible – it’s the most armoured part of your tank after all. In Tier IX battles you need to be more careful. Do not attempt to enter into a head-on gunfight with higher-tier tanks. Support your teammates and, if possible, try to keep enemy vehicles highlighted for artillery. If you see that the enemy team has a lot of Tier IX heavies, it is advisable to choose an alternative route for your attack and try to sneak up on them from behind. The WZ-111 is also effective when playing in a platoon. The main point to remember when building one is to keep in mind the tank’s preferential matchmaking. The following tanks are great to team up with: IS-6, 112, KV-5, FCM 50t and Jagdtiger 8.8 cm. Good luck with the mission, Commanders!